Thanks to the ambitions of two creative minds and financial support from a crowd of hopefuls at Kickstarter, there's a game coming out that's called Dog Sled Saga. It's about driving dogs through the snowy tundra in order to win races, gain fame and form bonds. It's heading to the PC, Mac, Linux, iOS and Android platforms. It's a real thing, and we here at TechnoBuffalo have sort of fallen in love with it. We contacted Dan FitzGerald and Lisa Bromiel, the creators, and they agreed to chat with us about Dog Sled Saga. For your reference right up front, Dan is handling the programming and music while Lisa is in charge of the visual design. They're both new to game creation, which sort of adds an extra layer of awesome to this project. Let's start with what Dog Sled Saga is and how it plays. As it's still in beta form, there are things Dan and Lisa will be adding and changing between now and release, but the core gameplay should remain the same. 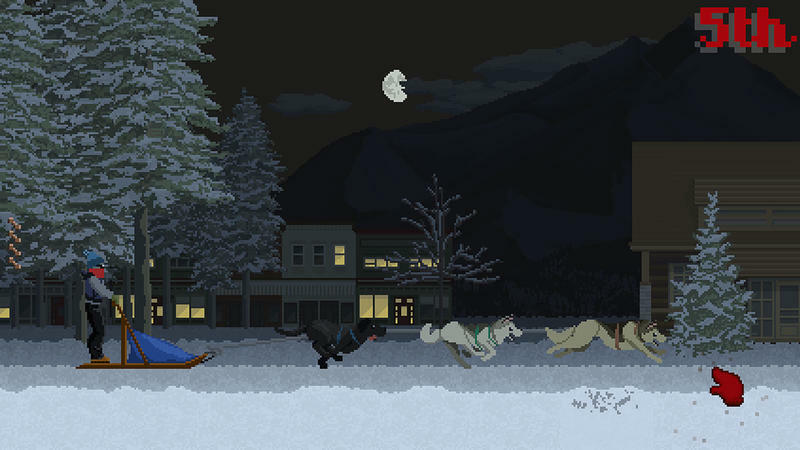 You'll enter races as a sled driver, each contest randomly generated with unique conditions, lengths and obstacles. Once you're driving your dogs, you'll feed them biscuits on the go and tell them when to leap over boulders. It's an exceptionally simple concept, but the nature of the gameplay here is fodder for addictive play and relationship driven reward. You can see it in motion in the preview video at the top of this section. "Dog sledding seemed like a good vehicle for what we wanted to do," explained Dan. "It's a demanding, competitive pursuit where the co-dependency between humans and animals is high." That co-dependency isn't exactly earth shattering in Dog Sled Saga's current form. Your dogs will get tired and unhappy if mismanaged, but that only leads to less speed and the need to replace team members. There's not much here that makes decisions in game all that hard… yet. Initially, Dan and Lisa were looking to create a dynamic relationship of responsibility between players and their dog team without the risk of in-game injury to the pups. They've since rethought that approach. We asked Dan and Lisa about how they intend to give more weight to the player responsibility they intend to create. "We're seeing now that the game definitely calls for some more dire incidents, because the current negative effects (faults, mostly) ease in and out too gradually." In play, Dog Sled Saga doesn't have the weight Dan and Lisa discussed during their Kickstarter campaign. "We actually changed our mind about adding an injury system, which is on the way," revealed Dan. "Another thing we're thinking about is how to add higher stakes to certain races, because again, money alone is too gradual an incentive." They're raising the stakes, and that was the singular complaint we had with this game during our few days of play before initiating this interview. As simple as Dog Sled Saga seems to build, it's quite obvious, after hearing from Dan and Lisa, that this project is ambitious, inspired and entirely in-progress. I played this game alongside Eric Frederiksen, another writer for TechnoBuffalo, and we both sort of wondered where they'd take the project from its current form of race and micromanage. Eric, more specifically, wondered how Dan and Lisa intend to give Dog Sled Saga a more finite objective than race and reward. "We have a scenario with a rival who you'll have to chase up the league in mind," Dan told us. "There are also a few in-game factions who you can cater to, and each of those will have an endgame of sorts. However, we want to allow players to keep racing beyond those points, but we do need figure out how to make the late game more coherent." Factions, rivals and endgame concepts, those are all big directions for Dog Sled Saga. There are changes in store for the game's core, in-race mechanics, too. Right now, when you perform a neat trick like bouncing a biscuit off a tree and into a dog's mouth, you'll see and hear a camera flash. "The current reward for camera flashes is an increase in fame, which can lead to some upgrades via sponsorships (tangle-deterrent rope, lower-friction sled, extra funding, or larger foodbag, at the moment)." That list of sponsorship items and the sponsorship process itself will both be getting more attention, expansion and personality, according to Dan. We asked Dan and Lisa both what they love most about Dog Sled Saga and what they're dying to change. Dan went first: "I think I love how responsive the dogs feel already. They're going to get more of that eventually, too. I'm dying to make the races less samey in presentation, and to make our setting have more recognizable sites." Then Lisa: "I'm really glad to have an ongoing project that we've been working on over a long timespan. It's been a really long time since I've done something like this (since school). I can't wait until we can concretely show the players progress. I've also been wanting to change the look of the musher for a really long time, and add more types of people." As we said above, Dan and Lisa are new to making video games. Dog Sled Saga is their first effort, and that means this project is a first in a lot of ways for the team. For instance, it earned money through a successful Kickstarter campaign. That campaign gave Dan and Lisa a fanbase, something they've loved having. "It's been super motivating to have a handful of very devoted fans (before, during and since the Kickstarter)," said Dan. "We're occasionally anxious that we aren't doing a good enough job holding up our end of the relationship, just because we have a lot of balls in the air for two people. It has meant a lot to us, though!" That motivation has pushed Dan and Lisa to approach Dog Sled Saga with a lot of commitment. Dan explained that he actually had to program the game over again in a better engine during the Kickstarter campaign. "I am so glad I took the time to do that, by now," he told us. When a new or revised mechanic falls into place and feels right, it's really gratifying, especially because instants before that, I usually feel a little hopeless. This project has created an opportunity for perspective and growth when it comes to game creation for Dan and Lisa. They both admitted fault and learning a lot through this process. For Lisa, seeing game art in motion threw her off. Here's Lisa: "I was surprised by how you can make a still composition and once it's in motion it looks really different, and certain things stand out differently. It's hard to predict how it'll look. I also like seeing the older images we have and looking at how much more full the game looks now." That conception-to-reality flow of realization translated to changing game mechanics, too. Dan told us that "a lot of game mechanics that were super overcomplicated when they were conceived have been ripped out and replaced with something more effective." "For example," he went on. "We knew we wanted dogs to have status effects that would enhance or hinder their performance, but the tuning of the game was so picky that a slight shift would make the challenge crumble or become insurmountable. I replaced a few overcomplicated formulas with some much broader, simpler strokes, and it worked. I get the feeling we have a lot more of that kind of thing ahead of us." Dan told us that he "knew that getting gameplay systems across to players was going to be hard," and that he knew he "wanted to strike a balance between being intuitive and subtle," but that it surprised him how truly challenging this aspect of development is. "It seems like subtlety is less important to me now than just making sure that the dogs seem to be their own beasts. When a new or revised mechanic falls into place and feels right, it's really gratifying, especially because instants before that, I usually feel a little hopeless." It's probably just as gratifying, we assume, to hear that fans are falling for Dog Sled Saga. Even we're victims to this game's instant charm and slow-burn addiction. 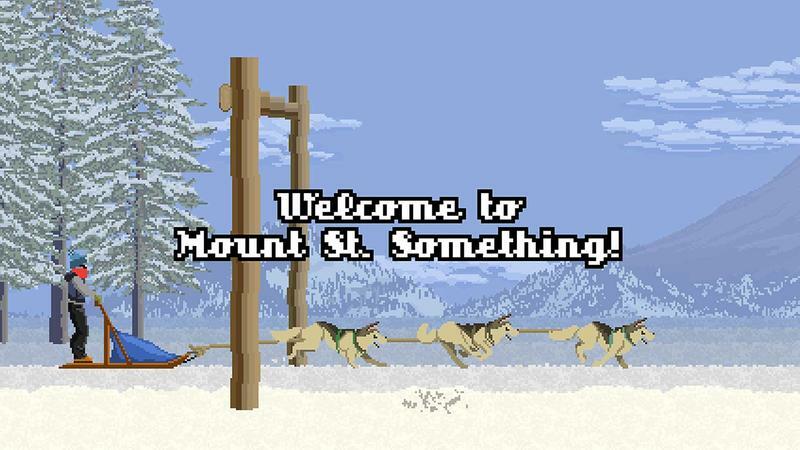 When it's ready later this year, Dog Sled Saga will be available for PC, Mac, Linux, iOS and Android devices. You can pre-order the game now for $10 and have access to the same build we played. 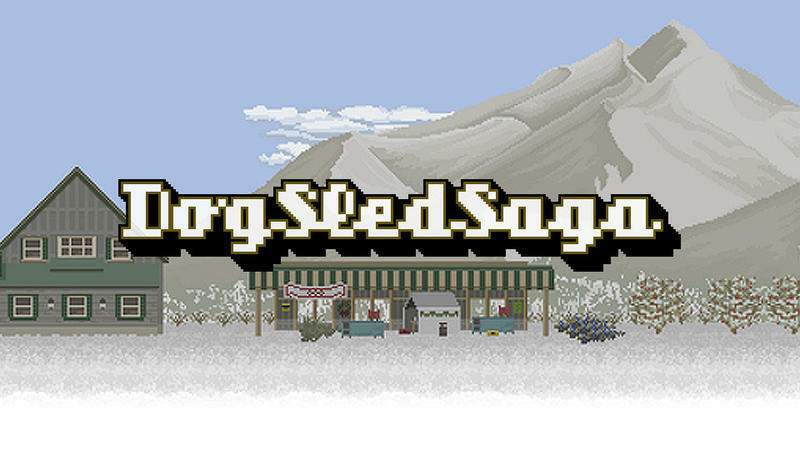 If you're the type that likes to play titles on Steam, vote for Dog Sled Saga in the Greenlight program. We can't wait for Dog Sled Saga, and our time with Dan and Lisa solidified our excitement.